Apple may have sold gazillions of iPhones in the latest quarter, but the questions about iTunes are still coming strong. This week, I look at three interesting questions. How can you label live recordings by date and set? 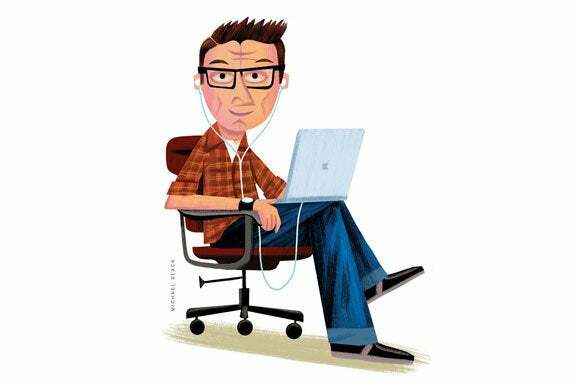 How can you sync from iTunes Match to a non-iOS iPod? And what are those mystery columns that show up in the iTunes library? Q: I have a live recording of a band’s entire run from one venue. This is a multiple disc set. I would like to break the shows down by date and then set, but all iTunes offers is “Disc 1,” “Disc 2,” and so on. I can re-tag the files so that each set or night is a disc, but they will still be labeled with this “Disc 1” scheme. Is there a way I can present the discs as they are actually named—“Night One-First Set” and “Night One-Second Set”—in Albums view, rather than the way iTunes names them now? This is something I’ve done with a number of recordings. Have a look at the screenshot below of some 1980 Bill Evans recordings from three box sets. I felt it was better to label the recordings according to their dates and sets so that I could listen to them in a more organic way, rather than grouping them by album and disc. None of the sets fits exactly on one disc, so each CD contains music from more than one set. I’ve re-tagged these live recordings to show their dates and sets. Doing this is easy. First, move all the tracks, in order, to a playlist where you can manipulate them. Select all the tracks from the first set or date, and then press Command-I. In the Album tag, enter the text you want to use to identify this music—as you suggested in your question, you could use Night One – First Set, or you could use a date, as I do. Click OK to save these changes. The tracks will now be labelled the way you want. However, there’s still one problem. You may have tracks whose numbers don’t match those on an album. Since some of the sets or dates may be split across discs, you may have both Disc 1 and Disc 2, for example, or the tracks may begin, say, at Disc 3, Track 6, ending with Disc 5, Track 2. There’s an easy way to fix this. Doug Adams’ free AppleScript, Albumize Selection, takes all the tracks and re-numbers them correctly. To use it, select all the tracks from a specific date or set, run the AppleScript, and it will number them from 1 to whatever number the last track is. You will have to manually change the disc numbers, however. Select the tracks, press Command-I, and click in the Disc Number field. Press Delete, press Return, and then click OK.
Q: Is there a simple method to load a music playlist on an iPod nano when using iTunes Match? It seems the only songs that get transferred are tracks in the iTunes library the iPod’s connected to. I’d like to sync it to a smart playlist that contains all the music I’ve purchased in the last three months and some of this music is on iTunes Match. iTunes can only sync songs that are physically in your iTunes library. With iTunes Match, you can download songs to an iPhone, iPad or iPod touch, but not to an iPod nano, classic, or shuffle. To sync any such playlist, you’ll need to first download the music. There are two ways to do this. 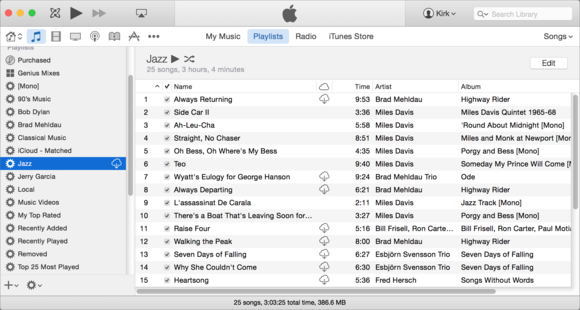 In the screenshot below, I show a smart playlist where some of the songs are on my Mac and others are in the cloud. When some of the tracks in a playlist are in the cloud, iTunes displays a cloud icon next to the name of that playlist. As you can see, there is a cloud icon to the right of the playlist’s name in the sidebar. (If you don’t see the sidebar, click Playlists in the navigation bar near the top of the iTunes window.) If you click this cloud icon, iTunes will download all the tracks in the playlist that are not stored locally. You can also select all the tracks in the playlist, right-click, and then choose Download. Q: I have two columns on the left side of my iTunes window that I don’t understand. I have compared every setting and preference with my partner (they are all the same) and he does not have these two columns. I have attached a screenshot. Can you explain what they are? What are the mystery columns at the left of the window? What you’re seeing are the Artwork and Track Number columns. The Artwork column appears when you open the View Options menu (press Command-J, or choose View > View Options), and check Show Artwork. However, since you’ve sorted your music by Name (you can see that you have because that column’s header is bold) the artwork is not displaying. If you want it to appear, you need to also check Always Show, just below Show Artwork. Otherwise, the column is empty, unless you’ve sorted your music by, say, Album. Do that and there will be enough tracks with the same artwork next to each other for the artwork to display. The second column is the number of each track on its album. Again, since you’ve sorted by Name, these don’t seem to be in any order. You can get rid of this column, if you wish, by opening the View Options menu, clicking Show Columns, and then unchecking Track Number.